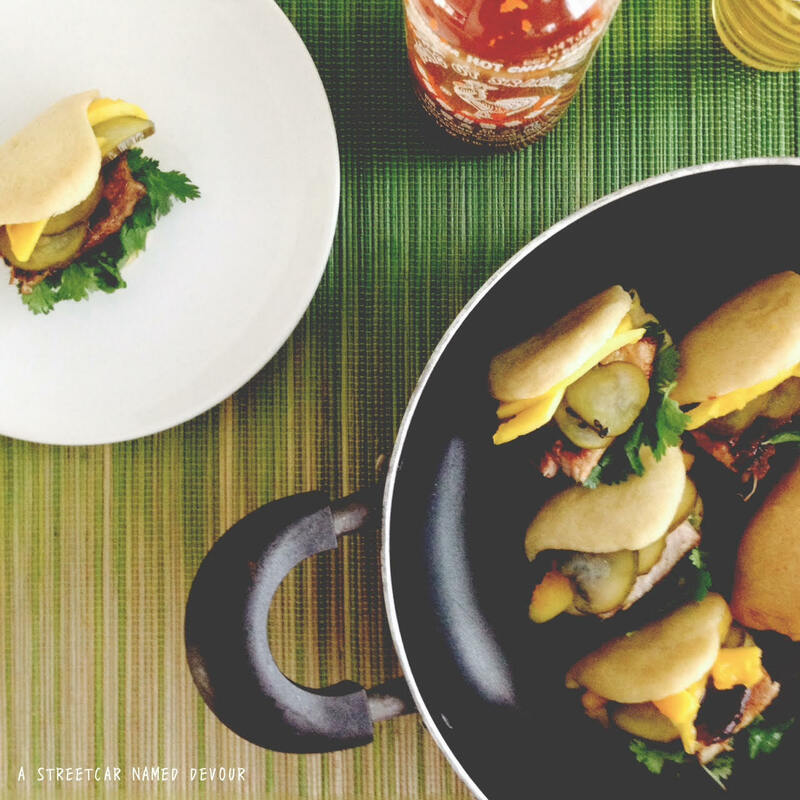 Gua Bao is a Taiwanese street food, comprised of a steamed bun, braised meat, and other fillings. I was first introduced to these teeny-tiny bites of delight while I worked for a food truck in San Francisco. Every weekend our truck met with other food trucks at Fort Mason hosted by Off the Grid, a Bay Area-based food and music event planner of sorts, bringing together only the best local food trucks at different venues weekly throughout the Bay. Off the Grid events were super fun to work because we were always busy and we got to meet some really awesome and talented people in the food truck community. 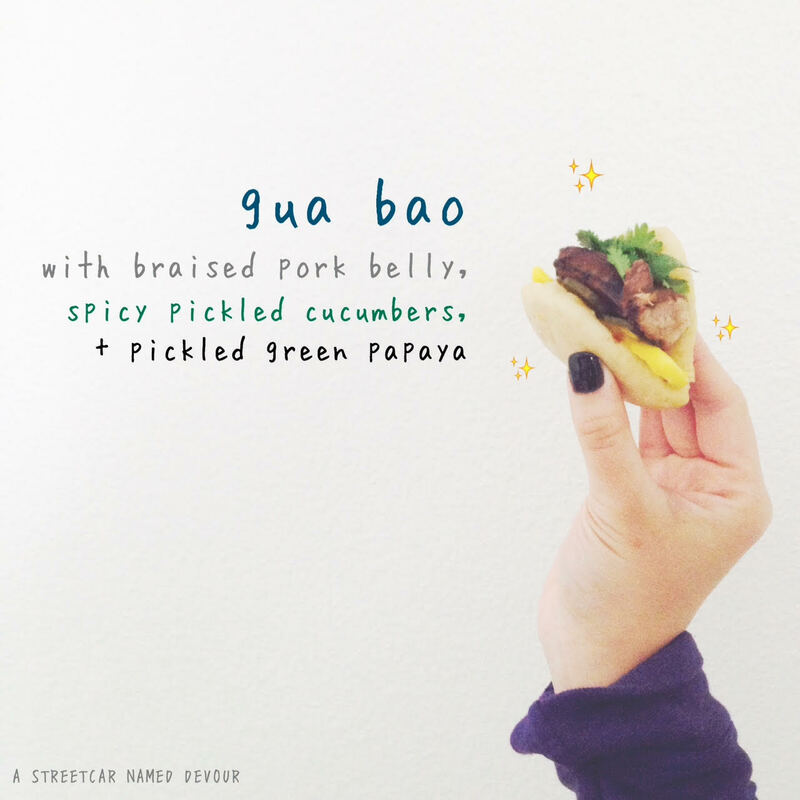 One of my favorite trucks that I became a huge fan of was Chairman Bao, food truck that specialized in gua bao. 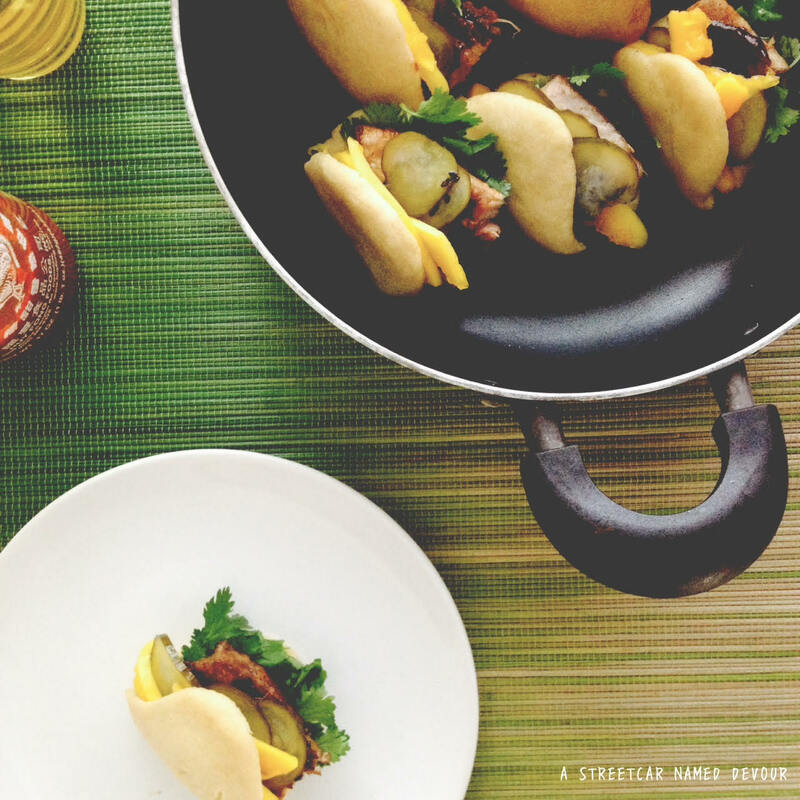 A light and fluffy steamed bun with a tender, crisp slice of pork belly, with a nicely pickled crunch of daikon. So many excellent flavors all in one bite. You can’t help but want more. 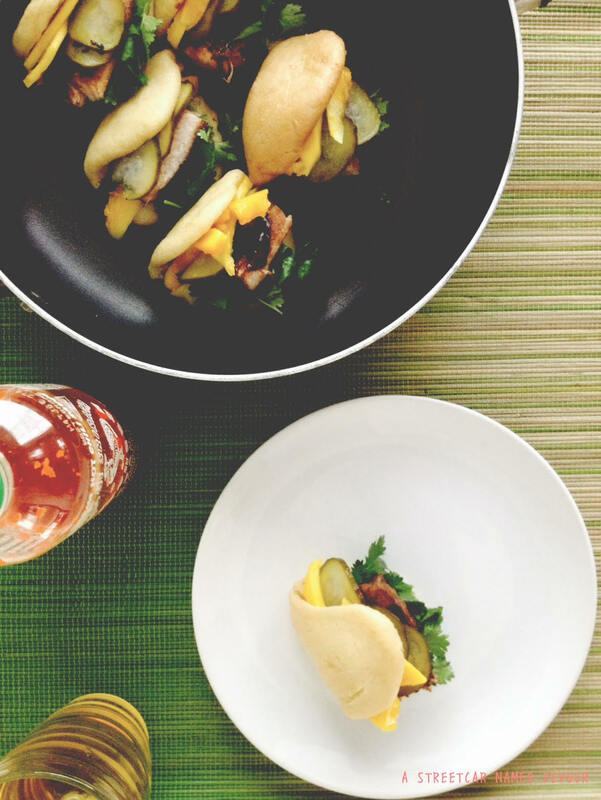 This week I put my own spin on gua bao with braised pork belly, sweet pickled papaya and spicy pickled cucumbers. Set up a stand mixer with a dough hook. Place the yeast and water together and mix just to incorporate to activate the yeast. Let it sit for 10 minutes. Then add in the flour, sugar, milk powder, Kosher salt, baking powder, baking soda and fat and mix on low for about 10 minutes. After the mixing cycle, your dough should be gathered into a ball. 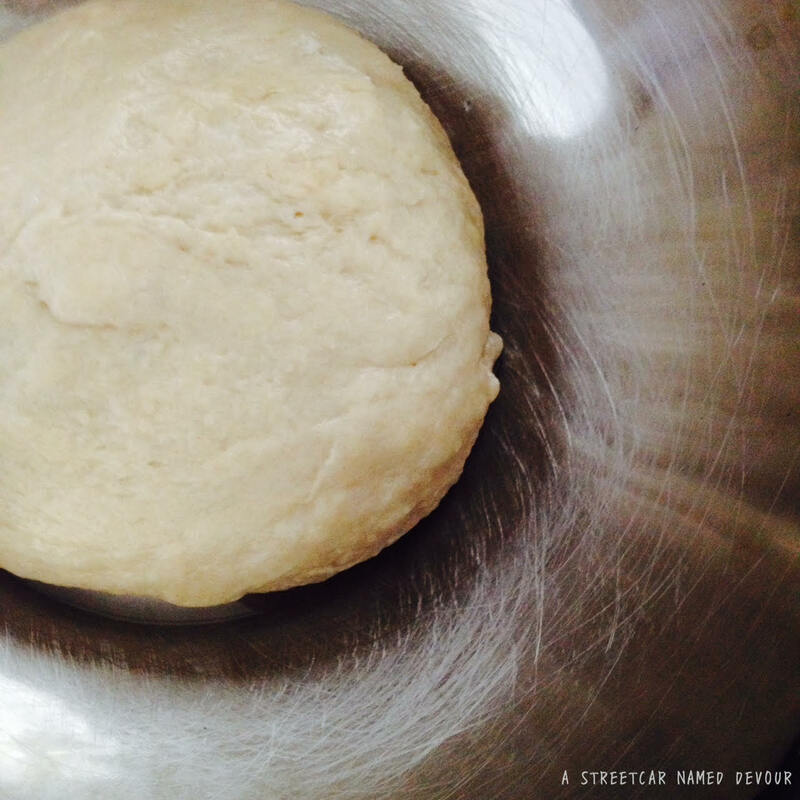 Place the dough ball in a lightly oiled medium-sized bowl, wrapped in plastic wrap. Keep the bowl in a warm area of your kitchen and allow the dough to rest for about 1 hour to 1 hour and 30 minutes, or until the dough has doubled in size. 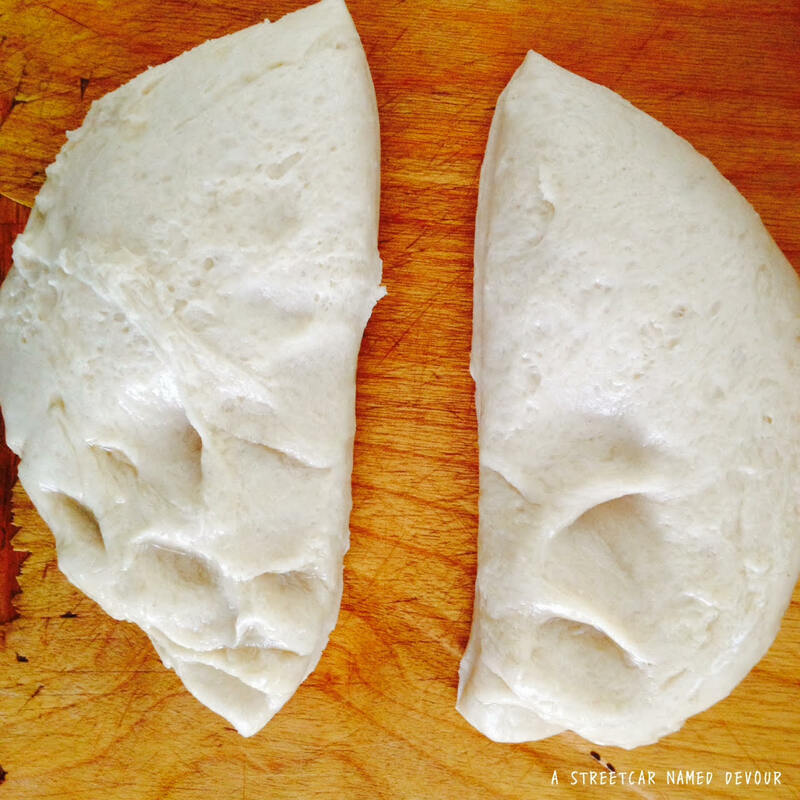 Once the dough has rested and risen, transfer it onto a lightly floured work surface. Use a sharp knife to divide the ball in 2 equal-sized pieces. Then divide each half into 4 equal-sized pieces, making 8. Roll each piece into mini logs, then cut each log in half, making 16 pieces total. Each piece should weigh about 25 grams each and be about the size of a Ping-Pong ball. Then roll each piece into a ball and place on a baking sheet. Loosely wrap the sheet tray with plastic wrap and allow to rise for a half-hour. 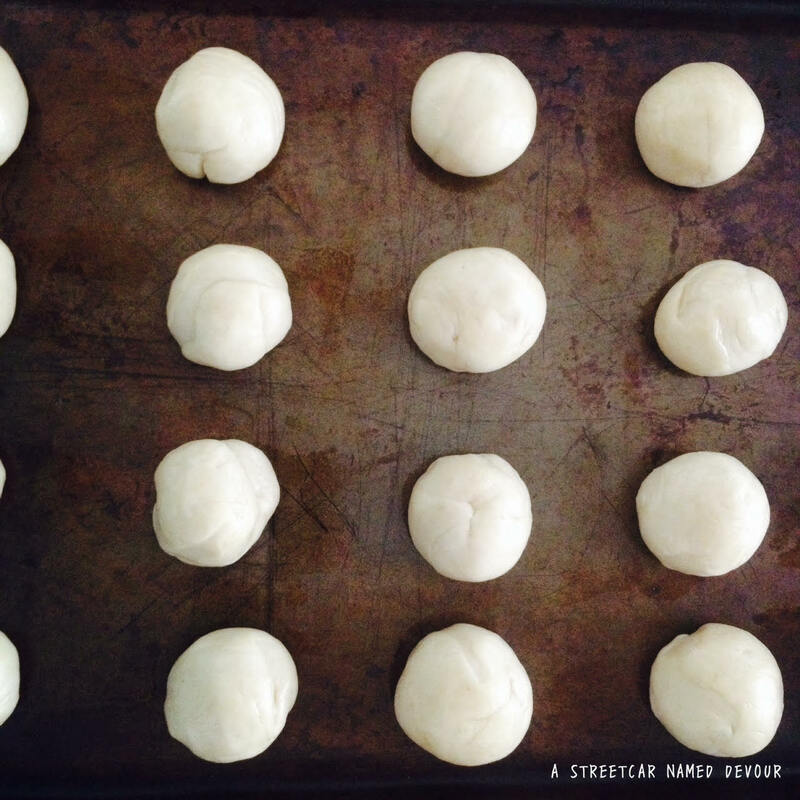 After the buns have rested, use a rolling pin to roll each ball into a 4-inch-long oval. Brush each bun lightly with oil, and lay a chopstick horizontally across the center of the oval and fold it over onto itself to form a bun. 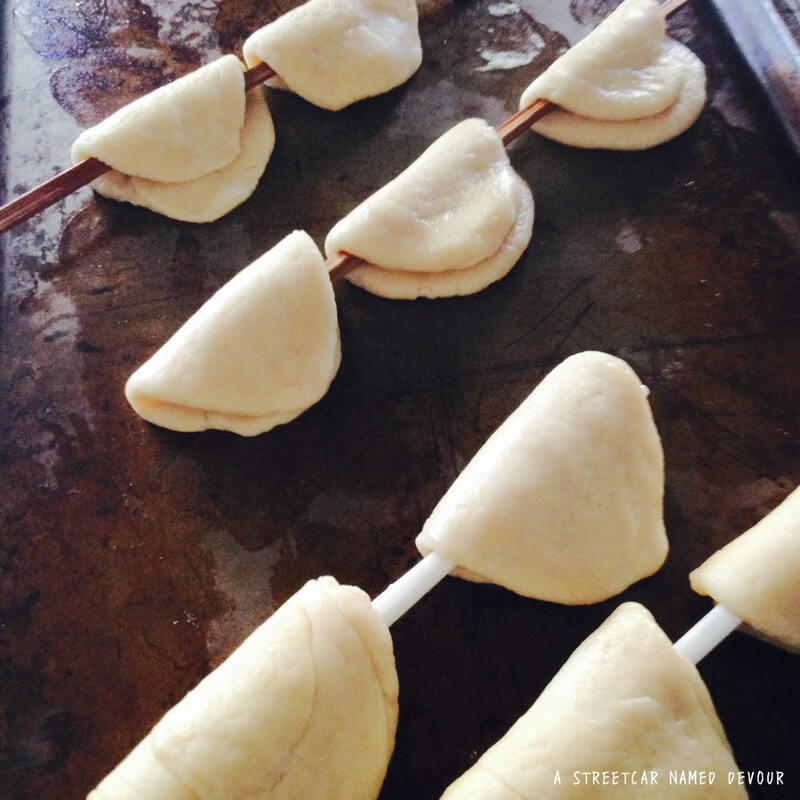 Gently pull out the chopstick, leaving the bun folded, and place it onto a sheet tray, allow all the rolled out buns to rest for another 45 minutes. Set up a steamer on top of your stove. 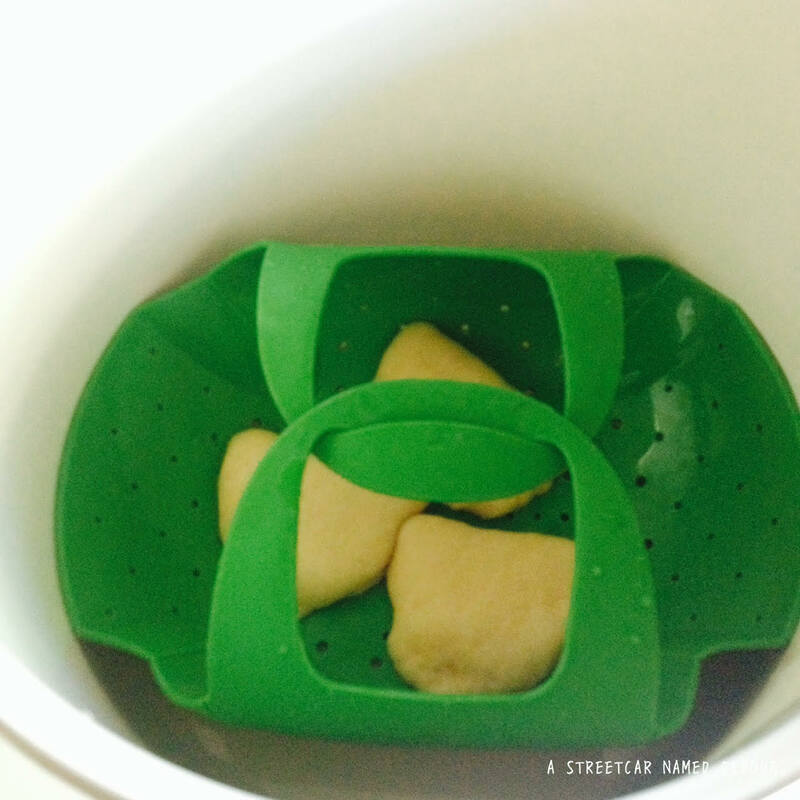 Steam your buns in batches so the steamer isn’t overcrowded, and steam them for about 8 to 10 minutes. 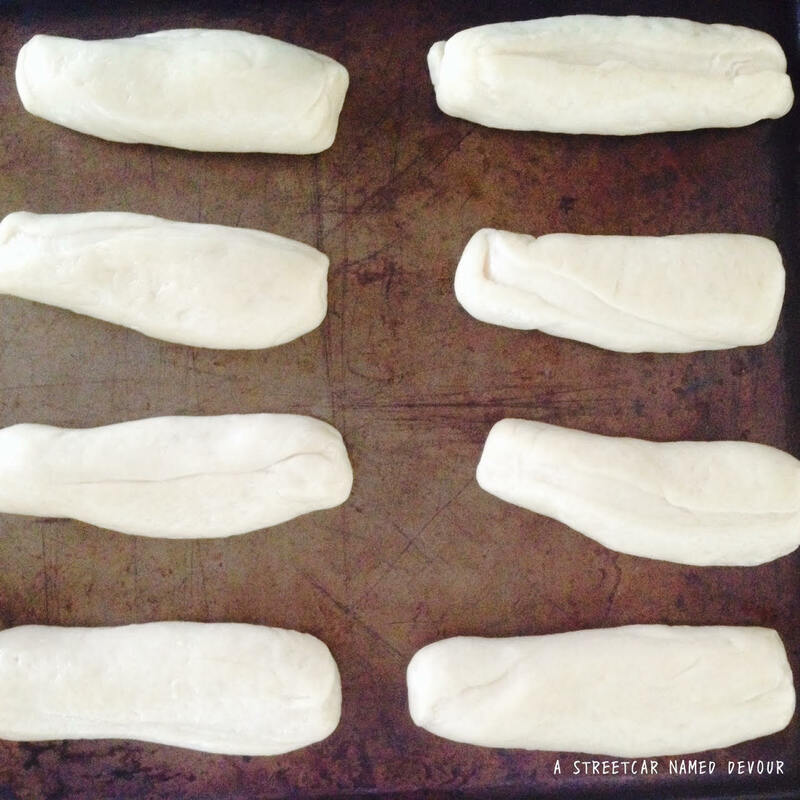 Quickly remove each bun and place on a sheet tray to cool. 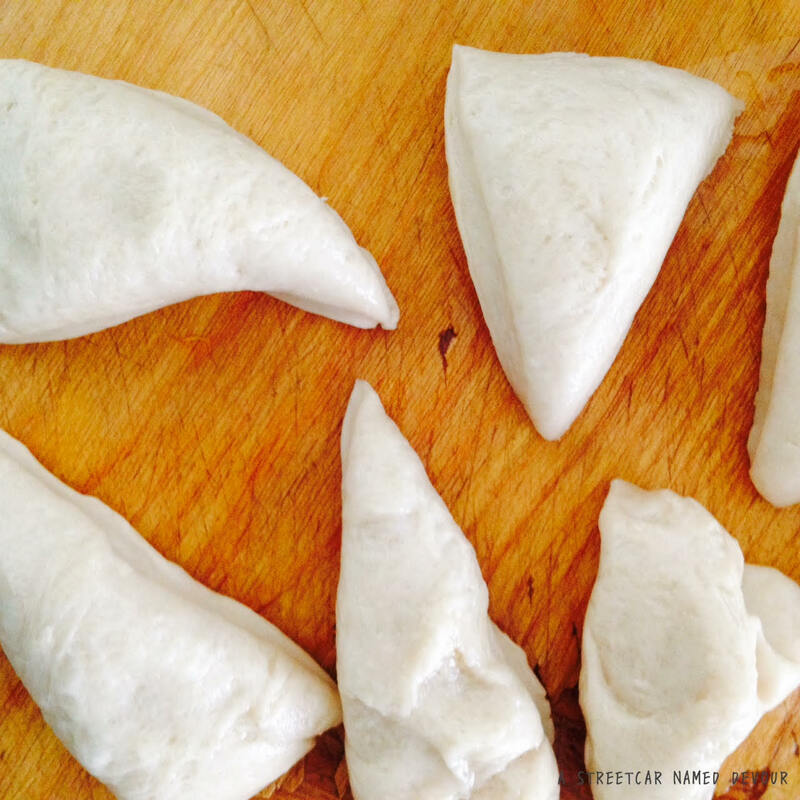 The steamed buns can be used immediately or kept frozen in Zip-Lock bags for up to 2 months. 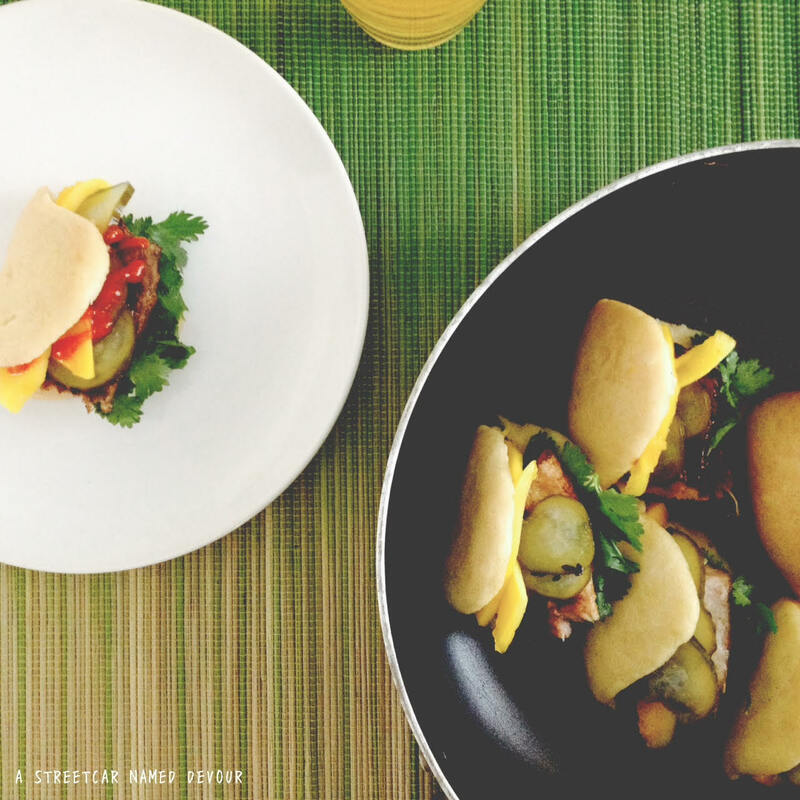 Reheat the frozen buns on a stove top steamer for about 3 minutes, or until soft and warmed all the way through. Heat a nonstick or cast-iron skillet on medium-high. 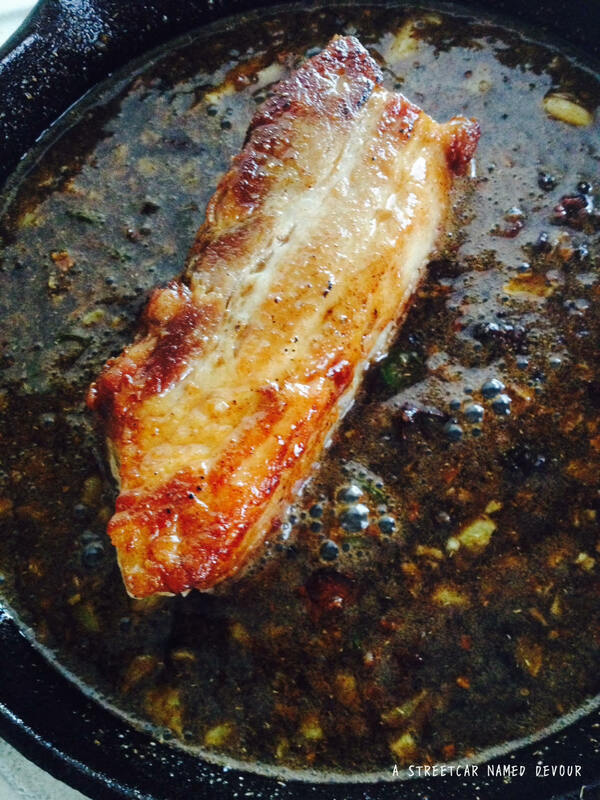 Once hot, place the pork belly into the pan and allow to sear for 5 minutes (or until light golden brown) before turning the belly onto the other side. Allow to sear for another 5 minutes, flipping the belly till all sides are seared nicely. Remove the belly and place onto a plate. Lower the heat to medium, then add the oil, garlic, ginger, and chilis. Toss for 2 minutes. Then add the star anise and brown sugar. Stir for a minute then deglaze with the wine. Stir till the sugar is melted. Add the rest of the ingredients and stir thoroughly. Return the belly to the pan and turn down the heat to low. Carefully cover the pan with a lid or aluminum foil. 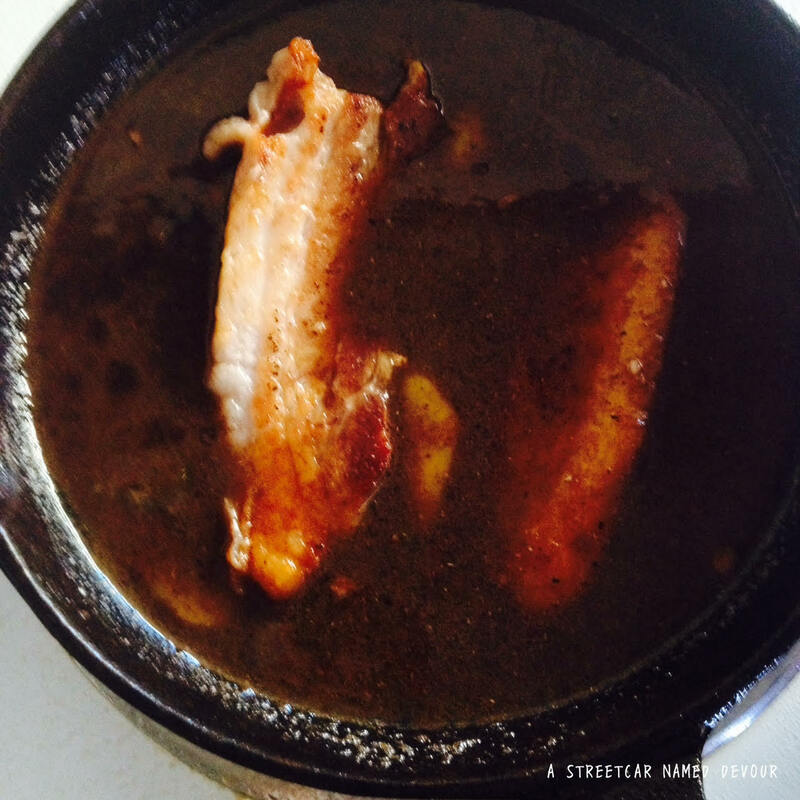 Allow to braise for at least 1 hour. Check the belly for tenderness after 1 hour. Cook till fork tender. Heat the vinegar, sugar, chili, salt, pepper flake and sesame seeds in a small pan till boiling. Place the sliced cucumbers in a Mason jar or deli cup, then pour the boiling brine into the jar then cover. Allow to sit in room temperature for an hour, then keep in the refrigerator. Bring the vinegar, sugar, water and salt to a boil until the sugar is dissolved. 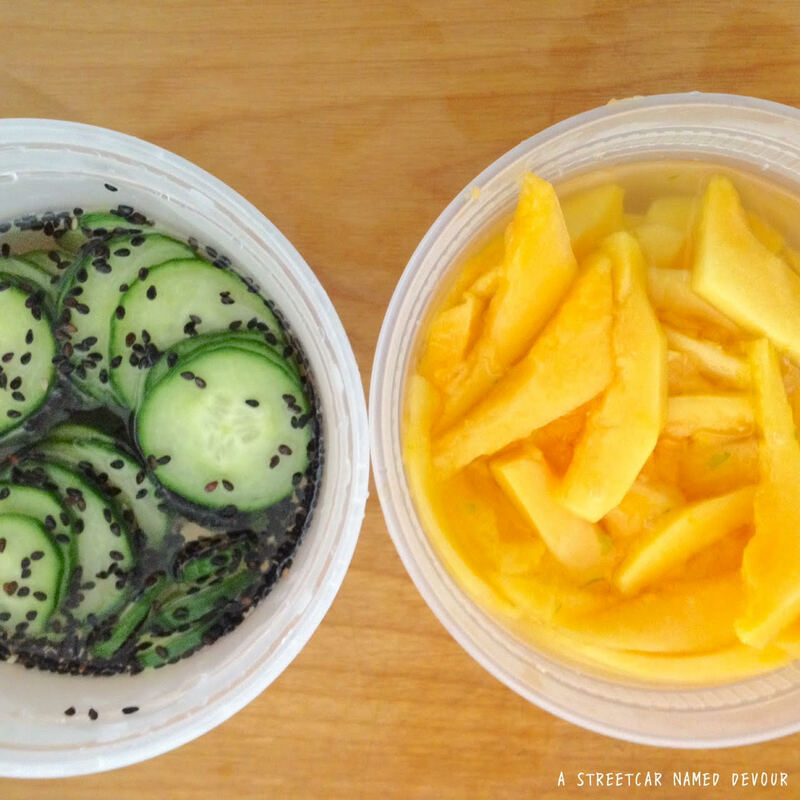 Pour the brine into a Mason jar or deli cup with the papaya. Cover tightly and allow to sit in room temperature for 1 hour. Then keep in the refrigerator. Pickles can be used once cooled, and stored in the refrigerator for up to 3 weeks. 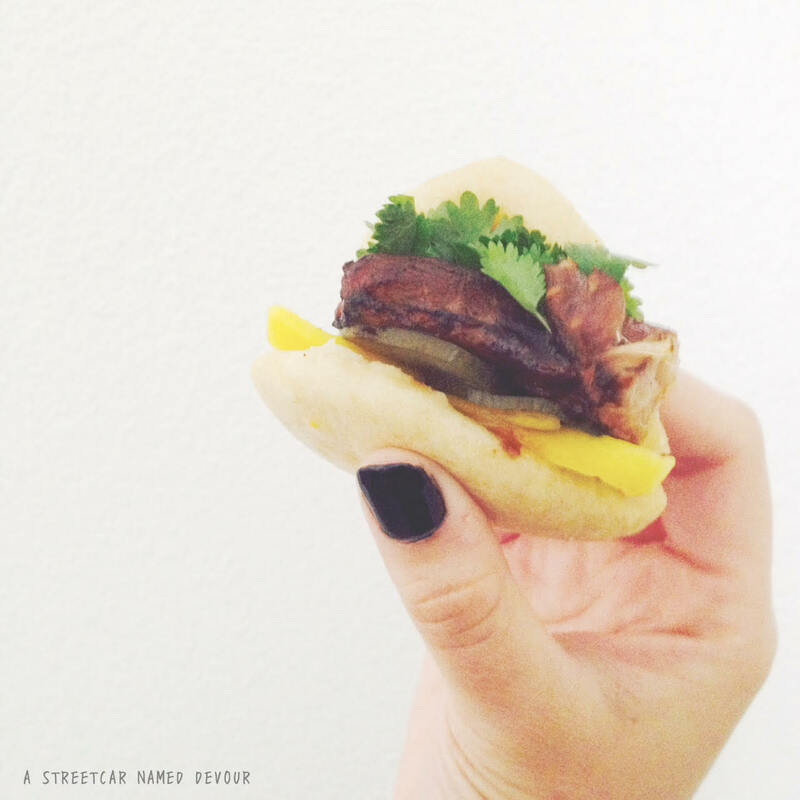 Place a slice of the pork belly into the bun, smear a little hoisin sauce on the pork. Put 3-6 cucumber slices and about 3 tablespoons of papaya on top of the pork. Sprinkle with cilantro leaves. Enjoy!